The 2019 Ford Ranger has been a fantasy of American mid-sized truck fans since the model went away years ago. If you’ve been eagerly awaiting its return, you’d have been excited to see that Ford’s official build-and-price was briefly live today. Ford has since told us that it was not supposed to launch until next week, so you’ll have to take our findings with some salt. As I wrote this intially, the 2019 Ford Ranger configurator was hot and ready but I’m guessing that link will be dead by the time you can click it. The selection screen lets you pick between a regular cab(! ), SuperCab extended cab and a SuperCrew four-door. Trim levels are the basic XL, slightly less basic XLT and nominally appointed Lariat. No King Ranch or Platinum. We hadn’t heard anything about a regular cab 2019 Ranger. And indeed, when you select it, the image still shows an extended cab truck. 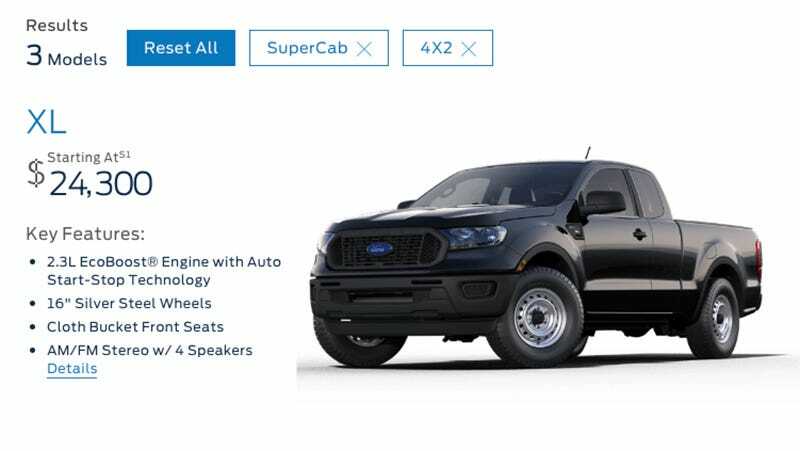 I suspect the $24,000 base XL two-wheel drive Ranger regular cab will be a fleet-only item, while consumers like us will start with the $24,300 SuperCab. You’d be nuts not to drop an extra $300 on the bigger cab, anyway. If only to unlock more seat reclining and some dry storage. Also, Ford said “no regular cab” at all. So that means the cheapest 2019 Ford Ranger starts at $24,300 and comes with steel wheels, a four-speaker AM/FM radio, and, like, nothing else. If you want four-wheel drive, the price goes straight up to $28,460. The Lariat starts at $38,385. If you start adding goodies on top of that, like a B&O stereo (about $1,800) and the FX4 off-road package (about $1,300) the price gets to the $40,000 neighborhood pretty easily. That FX4 kit, which you can apparently spec on any trim as long as you order four-wheel drive, includes an electronic locking rear differential, tow hooks, a skid plate, off-road screen in the cluster, front air dam delete, traction control modes optimized for slippery surfaces, and unique shocks which actually sounds like a great bundle for that price. Though I couldn’t help but notice that the Ranger is unique in the mid-size segment in that it’s the only one with just one engine option and one transmission. The Toyota Tacoma, Nissan Frontier and even the Chevy Colorado have both four and six-cylinder options plus the availability of a manual. That’s right, we still get the old Frontier, though not the new one. The mid-size truck market is weird. Still, I’m excited to start seeing more smartly-sized trucks on the road. And the Ranger looks like a compelling package in plenty of ways.